Argentina still has real legit cowboys. They are called Gauchos and they live in the Pampas or Patagonian grasslands. This is a good sign, because where there are cowboys…there are cows. Argentinians love beef, I mean who doesn’t, but they REALLY love beef. So it was a given that I should choose a dish with the starting role going to el carne. The traditional technique would simply have been to grill or roast the meat over a flame, which frankly sounds wonderful. But that is really the only thing people know about Brazilian and Argentine food so I looked for something a little more unique. Empanadas may not seem to be at first, but each region and peoples have their own filling combinations. The name means simply “breaded” but the magic lies inside the beautifully golden shell. One such mélange from the silver state includes paprika and hard boiled egg. This was certainly a flavor combination that I’ve never encountered but worked so well. My first time working with puff pastry was…a mixed bag. From years of watching cooking shows I knew it was not going to be easy to manipulate and it was not. Practice helped me improve and the second batch I baked came out much better. Even so, the recipe made a huge amount of filling and even if I had done the pastry part flawlessly, I can’t imagine all would have been used. That being said, it makes excellent leftover filler for tacos, burritos, or simply to mix with rice or pasta. 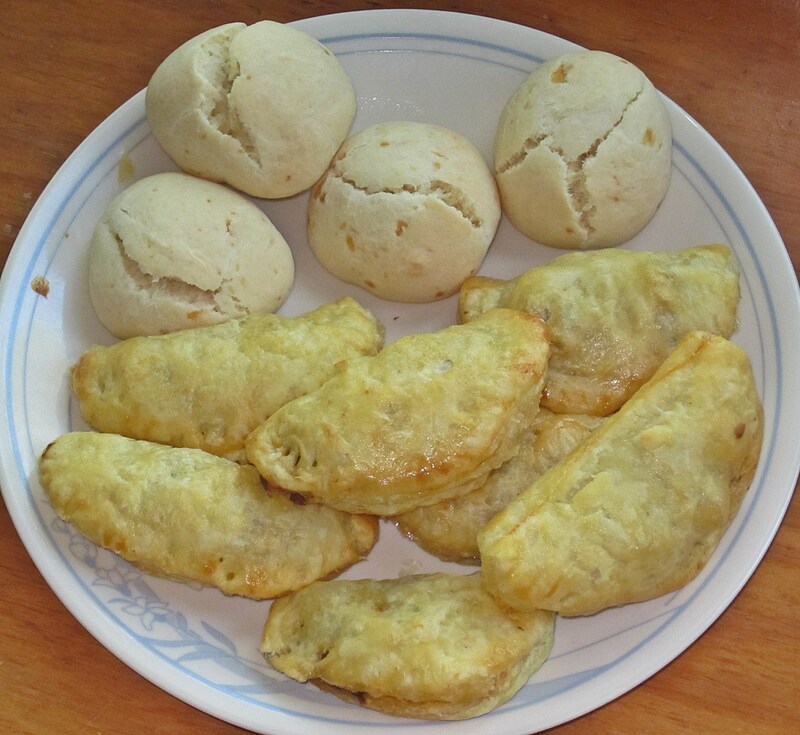 To go with the empanadas, I made a quick bread recipe for indigenous cheese rolls called “chipás”. 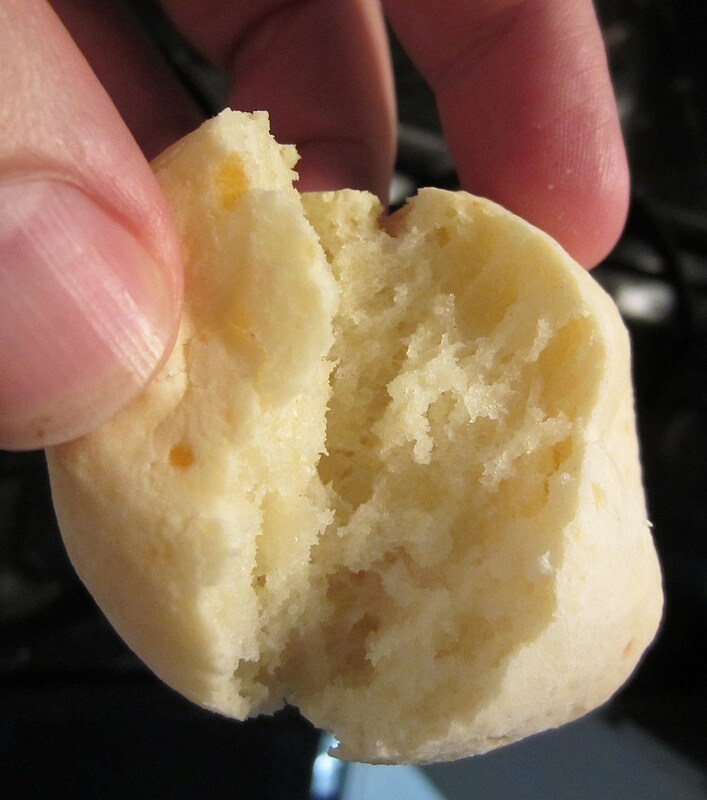 These buns are distinctive because they made with tapioca flour from the cassava plant. This flour has a very fine texture and the resulting roll has almost a velvety nap to it. They are soft and chewy on the inside and took no time to make and bake. Oh yea, it is also the closest country in the world to Antarctica. Next stop, Armenia. 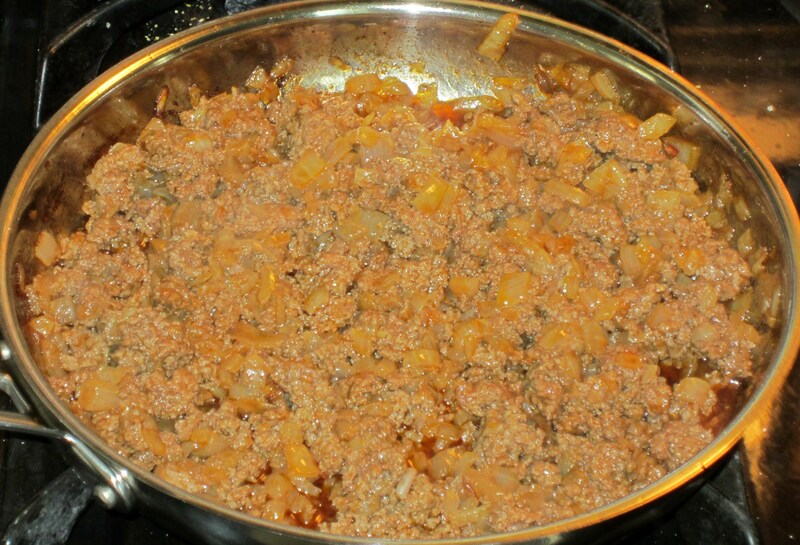 In a saute; pan melt the shortening and add the chopped onions. Cook the onions until just before they begin to turn golden. Remove from the heat and stir in the sweet paprika, hot paprika, crushed red pepper flakes and salt to taste. Spread the meat on a sieve and pour boiling water on it for partial cooking. Allow meat to cool. 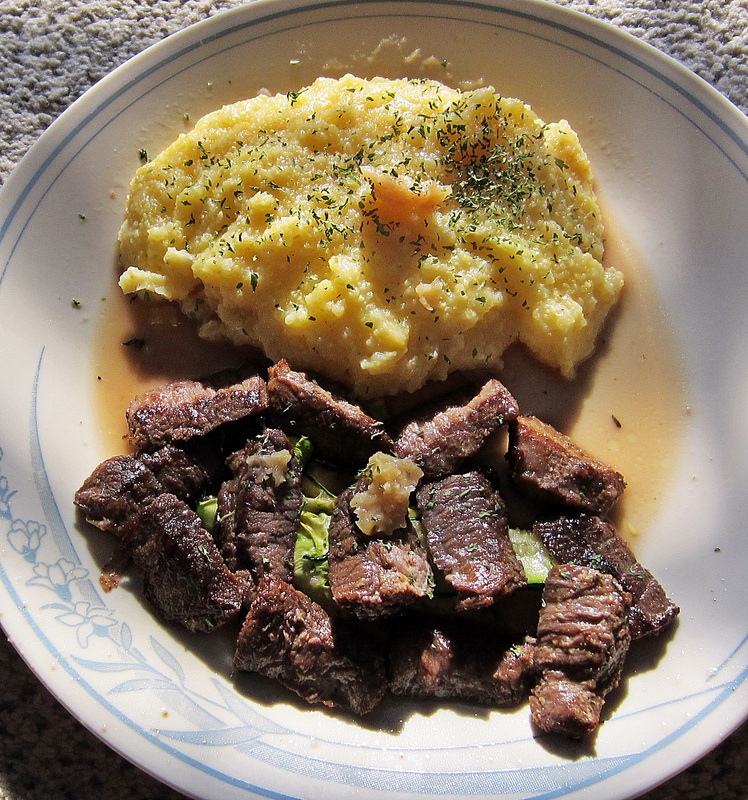 Place meat in a dish add salt to taste, cumin and vinegar. Mix and add the meat to the onion mixture. 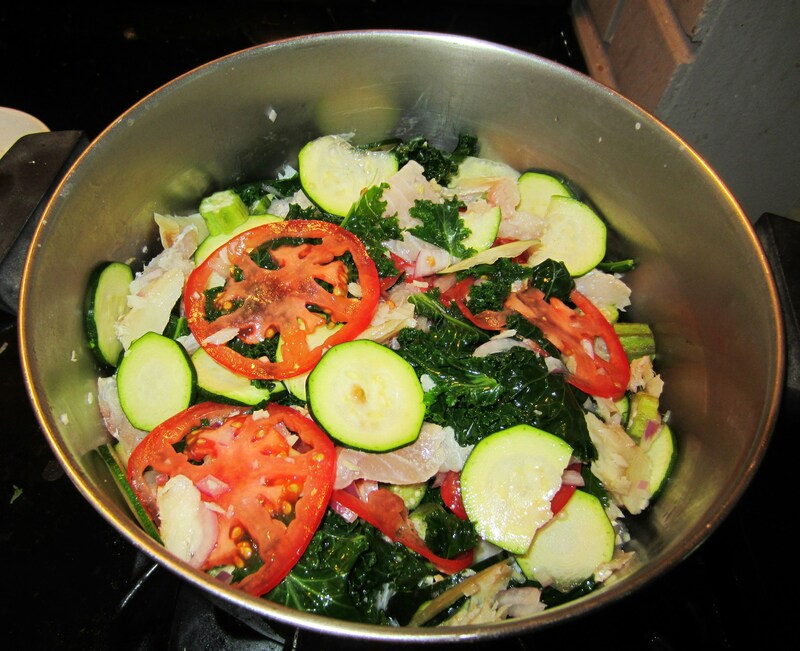 Mix well and place on a flat to dish to cool and harden. Cut puff pastry dough into 10 round shells. Place a spoonful of the meat mixture on each round; add some of the raisins, olives and hard boiled egg. Avoid reaching the edges of the pastry with the filling because its oiliness will prevent good sealing. Slightly wet the edge of the pastry, fold in two and stick edges together. The shape should resemble that of a half-moon. You should have a 2/3 to 1/2 inch flat edge of pastry to work with. Seal by twisting edge, step by step, between thumb and index finger, making sure to add pressure before releasing the pinch and moving on to the next curl. Other sealing procedures like pinching without curling or using a fork to seal will not prevent juice leaks during baking, and empanadas must be juicy. Preheat oven to 350 degrees F (180 degrees C). Place empanadas on a parchment paper lined baking sheet. Be sure to prick each empanada with a fork near the curl to allow steam to escape during baking. Glaze with egg for shine and bake until golden, about 20 to 30 minutes. France. At only ~175 square miles in area, this seems like a forgivable mistake to be sure. But there she sits; straddling the Spanish/French divide though her soul it seems is far more of the former than the later. The official language is Catalan named after the community in Spain, yet it shares more in common with French linguistically than it does with Spanish. Another extremely odd and interesting fact is that it is a Principality, being a monarchy headed by two Co-princes; but that’s not the weird part. The very strange fact is that those two Co-princes are the President of France and the Bishop of Urgell (the diocese in Catalonia), whomever they may be. Yet Andorra’s government is a parliamentary democracy, with a chief executive serving as the head. Weird right? Culinary it seems to me to share more with Spain than France, though when you are on a border it is very difficult to even make distinctions. The one factor that is omnipresent in Andorran cuisine is meat. Meat, meat, meat, meat, meat. 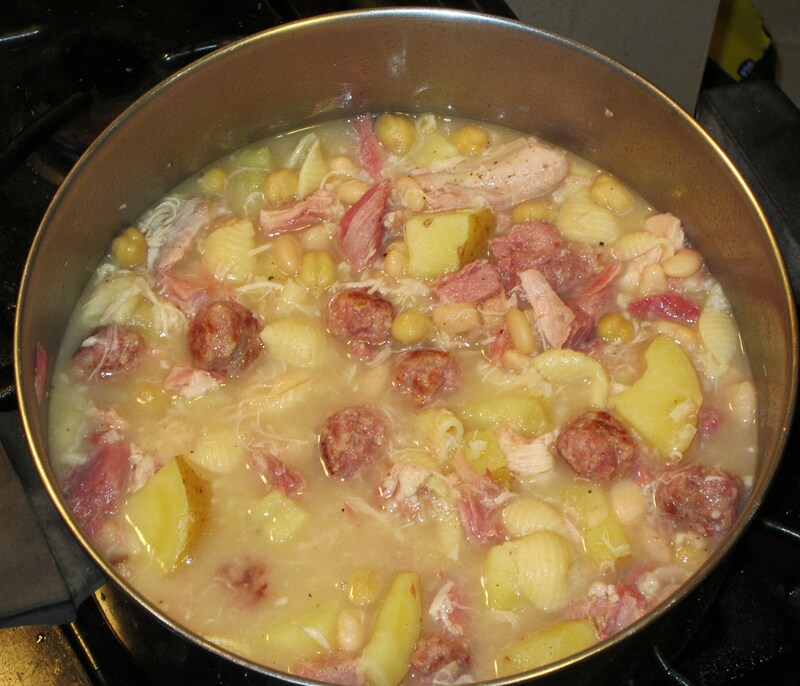 The dish I selected is Escudella (I carn d’olla), “meat from a pot”. It is recorded in a 14th century manuscript that it was eaten every day by the Catalonians. It is a soup featuring…you guessed it; meat. 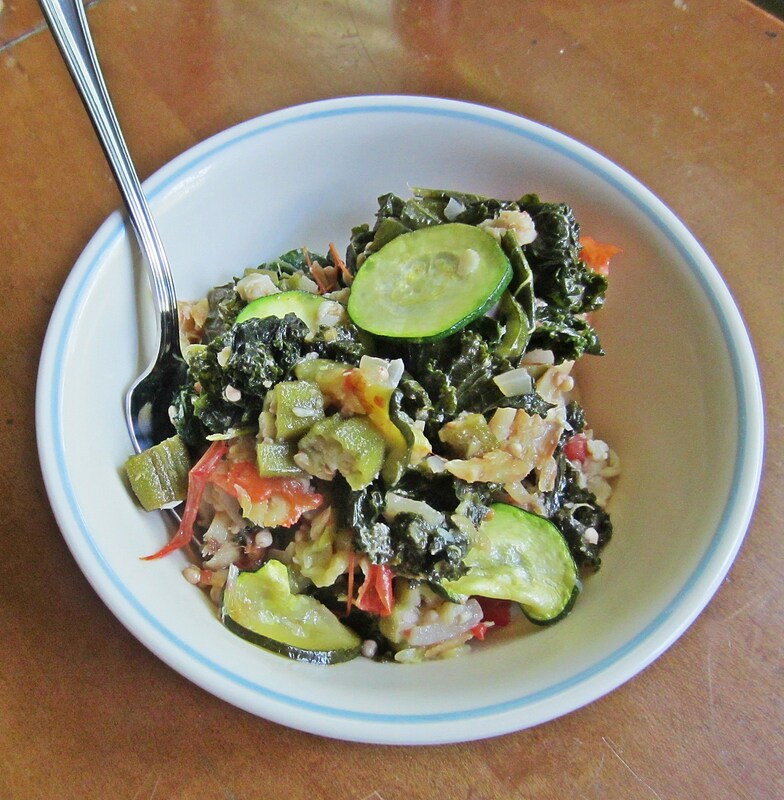 It also often has pasta, rice, and is based in a savory broth. I loved this dish, because it was super meaty, and I mean that in the best possible way. The inclusion of ham steak, chicken thigh, sausage meatballs added layer upon layer of different meat flavor profiles. The most important piece however was the marrow bone/ham hock. I used a large marrow bone with some meat still on it from the butcher. This gave the broth an unparalleled texture and flavor that I cannot imagine being achieved any other way. It is also very potent stock and I ended up adding about 2 cups of additional water towards the end which resulted in an actual serving size of 6 (your results may vary). The addition of the pasta, rice, and beans make it very filling and I found myself having to remember not to take too much. I highly recommend this soup to any and all meat lovers out there, but don’t skimp on the marrow bone… trust me! In our next installment, we go back… to the Africa. Angola to be precise. Roll the raw sausage into one- or two-bite sized balls. Rinse the dry beans in cold water. Meanwhile, cook the sausage balls over medium heat. 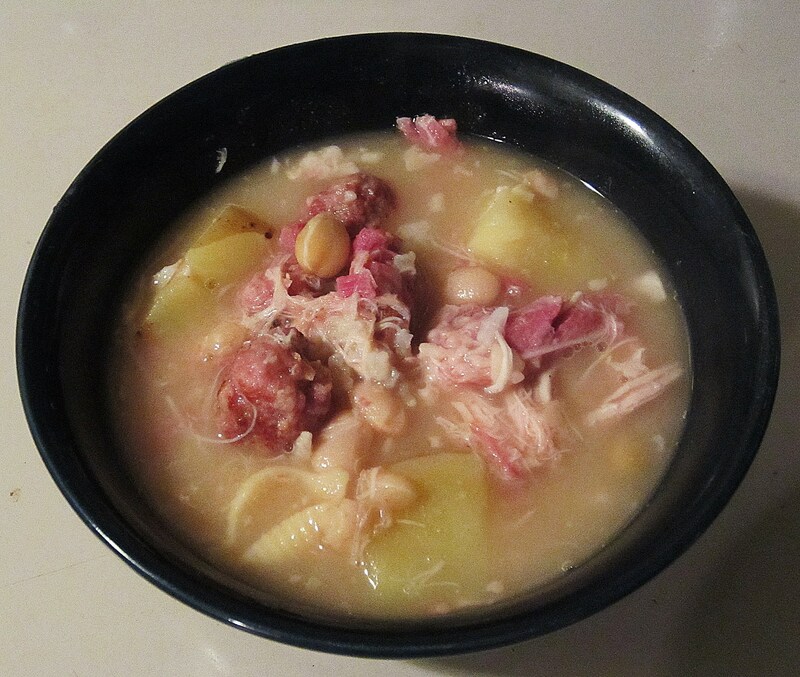 Put the beans, sausage, ham, chicken and bones into the pot with 8 cups of water. 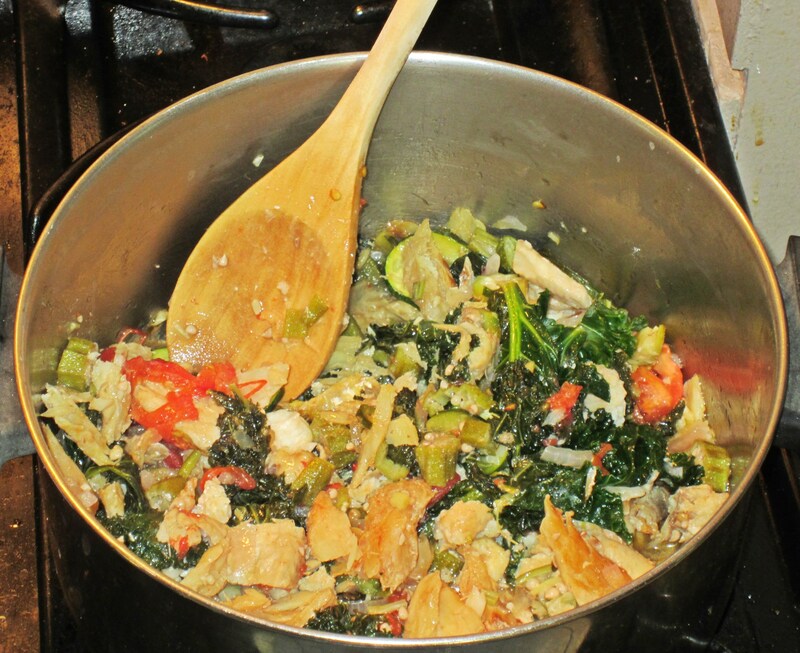 Bring to a boil, then reduce heat and let simmer, covered for 1 ½ hours. The chicken should be very tender, almost falling apart. Remove the bones and bring the remaining stock and meat back up to a boil (if there isn’t a lot of liquid you can add more water). Add the cabbage, potato, rice, pasta shells, garbanzo beans and salt and pepper. 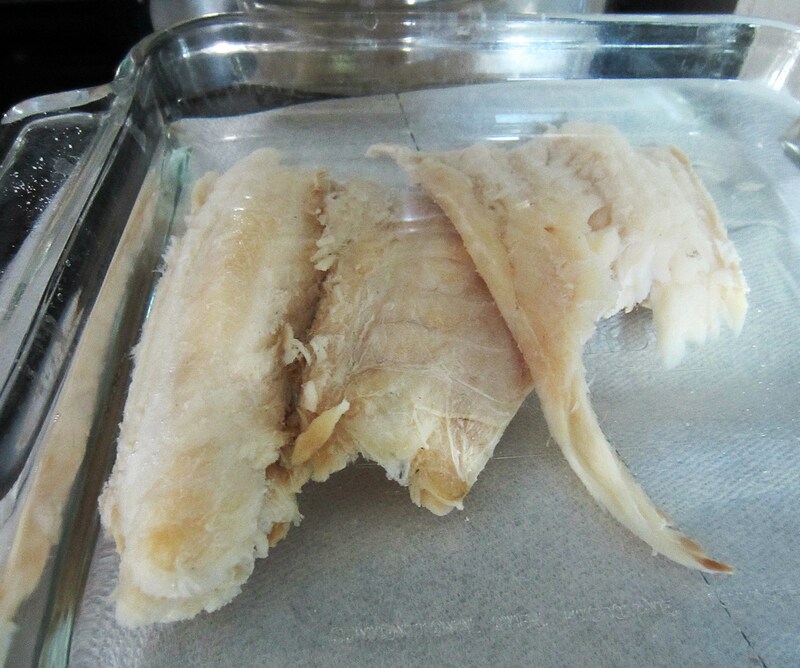 Cook for another 30 minutes, or until the potatoes and rice are tender.